Upon following his heart to Australia, Mick took another risk and decided to try fronting his own band. Prior to this point he had been making his position as a sideman or frontman. This opportunity for another change seemed right, so he assembled the Mick Reid Band. The band independently released their debut CD ‘Long Hard Road’ in 2003. The seven song EP was acclaimed by fans and critics alike. 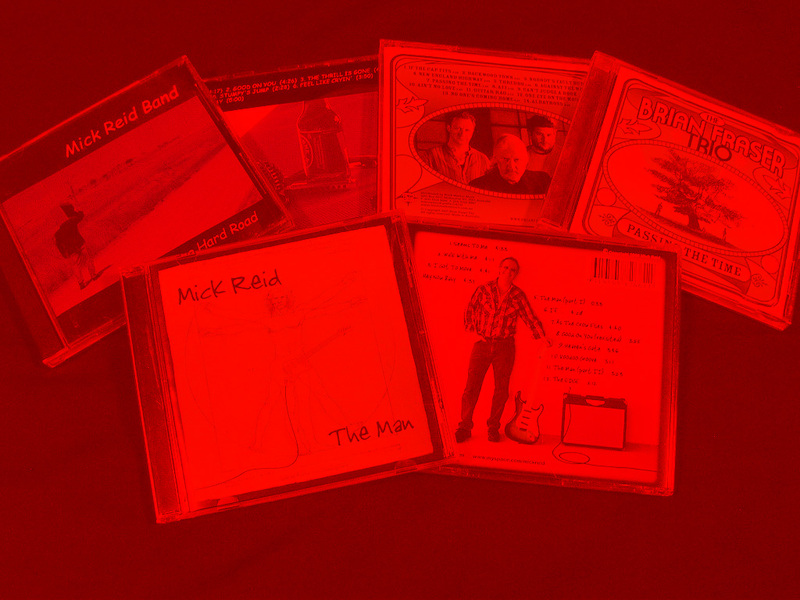 Every track from ‘Long Hard Road’ received radio play on nationally broadcast blues programs ‘Blues With A Feeling’ and ‘Nothin’ But The Blues’ as well as community and commercial blues shows all across Australia and overseas (USA,CAN). Also in 2003 Mick completed a series of successful tours as a duo with award-winning blues guitarist Brian Fraser (VIC). Following the success of these tours, in 2004 Brian and Mick teamed up with percussionist Benny Owen (Matt Corcoran, Ash Grunwald) forming the Brian Fraser Trio. Taking things back to basics in the trio, Mick’s blending of acoustic and electrified harmonica rhythms and riffs into Brian’s finger-picking lap slide guitar work reinforced the age-old rule of blues: less is more. 2006 saw the trio take away the Australian Blues Music Awards (a.k.a. the Chain Awards) for ‘Best Group of the Year’ with their album ‘Passing the Time’. The trio also received great support and attention as runner-up in the 2006 International Blues Challenge, Melbourne. After years of owning guitars, in 2007 Mick decided to knuckle down and start playing them seriously. Two years on and… Mick returned to fronting his own band. Mick Reid and Band are back as a three piece outfit with a new sound and approach. Mick has swapped his blues harp for an axe (not entirely though!) going out with a rhythm section and plenty of volume to make a raw boogie-blues-rock sound. Playing mostly open-tuned electric guitar is an vital component in producing the full sound and style that is his own. Mick’s paths have not always been the ones of convention! Mick has performed around Australia at pubs, clubs and festivals including the Australian Blues Music Festival in Goulburn (NSW); Thredbo Legends of Blues Festival (NSW); Canberra Blues & Rock Festival (ACT); Blues On Broadbeach (QLD); Toyota Gympie Muster (QLD); Blues At Bridgetown (WA); Yagubi World Music Festival (QLD); Bluestone Festival (VIC). Mick has shared the stage with renowned Australian Blues artists as Brian Fraser, Dallas Frasca, Pete Cornelius, Matt Corcoran, Jan Preston and shared billing with the best known Australian blues acts.